Jump in RMB share to 15%: catch up or overshoot? According to the recently released detailed breakdown of the Central Bank of Russia's (CBR) international reserves (available in Russian only at http://cbr.ru/Collection/Collection/File/14216/2019-01_res.pdf), the CBR reduced its US dollar (USD) assets by US$101 billion in 2Q18, which was apparently caused by the spike in foreign policy uncertainty in April last year. Around two-thirds of that sum was replaced with other low-risk currencies, as the euro (EUR) position went up by an equivalent of US$45 billion and Japanese yen (JPY) by US$21 billion. The biggest surprise was a massive purchase of Chinese yuan (RMB), which went up by the equivalent of US$44 billion. 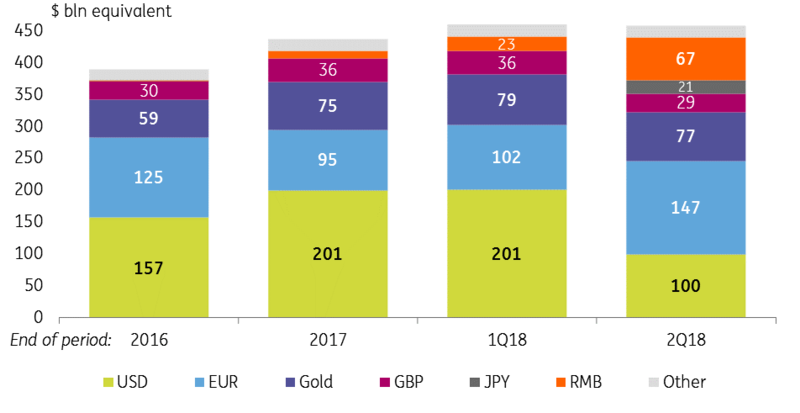 As a result, in terms of structure, EUR (32% of total) became the largest component of CBR international reserves, followed by USD (22%), gold (17%) and RMB (15%). The first question to ask following the sharp shift in the CBR reserves structure is whether the jump in RMB is justified. The answer here is not straightforward. At first glance, the spike to 15% may seem like a catch up with the growing role of China in the Russian external trade turnover, which, as we mentioned earlier, has been growing steadily over the last years and went up to 15% in 2017-18. However, it is also known that even the CN-RUS trade is by 70-90% USD-denominated due to the product mix, and the role of RMB in Russia's trade turnover is equivalent to around US$10 billion per year, which corresponds to only 2% of Russia's external trade. 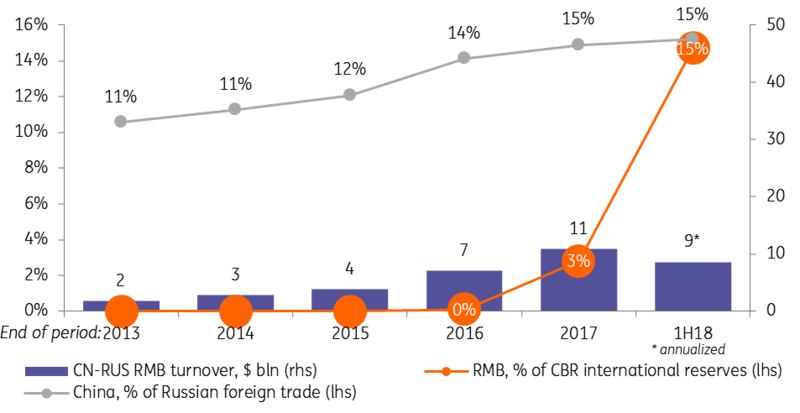 By that metric, the US$67 billion worth of RMB in the CBR reserves appear massive and may reflect Russia's political preference for a higher role of China as Russia's trade and investment partner in the future. 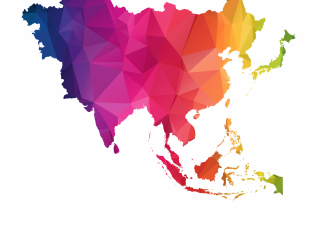 The second question that arises from the recent developments is whether the CBR has room for further cuts in the USD-denominated FX assets. In order to answer that question, one has to look at the liabilities side of the CBR's balance sheet. Part of the CBR's international reserves are funded by the government, which deposits most of its FX savings with its CBR accounts. According to our estimates, out of the CBR's total US$457 billion reserves as of mid-2018, around US$80 billion were attributable to Finance Ministry funding, including US$52 billion officially reported as National Wealth Fund (NWF) FX accounts with the CBR and an estimated US$28 billion worth of FX accumulated on separate FX accounts with the CBR during 1H18 FX purchases. The latter will be officially incorporated into the NWF in mid-2019. 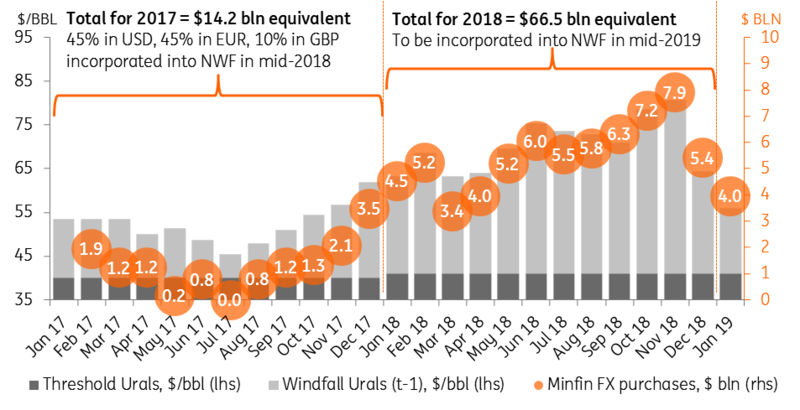 Another US$25 billion out of the NWF, according to official data, is not a part of CBR's FX position, because around 70% of that sum is invested into ruble instruments, while the remaining FX represent Minfin's special loans and infrastructure investments outside the CBR. The investment memorandum of National Wealth Fund (https://www.minfin.ru/en/key/nationalwealthfund/management/) dictates that the FX part of the fund should be 45% denominated in USD, another 45% in EUR and 10% in British pounds (GBP). This suggests, as of mid-2018 US$80 billion worth of the Finance Ministry's FX with the CBR was comprised of US$36 billion in USD, another US$36 billion in EUR and US$8 billion in GBP - all three figures comfortably below the CBR's assets of US$100 billion, US$147 billion and US$29 billion, respectively. This metric creates an impression that the CBR has further room for de-dollarization. One should keep in mind, that CBR FX liabilities keep increasing proportionally to the Finance Ministry's FX purchases conducted as a part of the budget rule. Having purchased US$28 billion of FX in 1H18, the Finance Ministry bought another US$38 billion in 2H18, most of it (US$31 billion) from the CBR directly, as there was a halt in open market purchases. As a result, we estimate that as of year-end 2018, US$101 billion out of the CBR's total US$465 billion reserves were due to the Finance Ministry, including US$45 billion on its USD accounts. This year, the Finance Ministry could buy another US$40-50 billion in FX, including US$20 billion in USD. 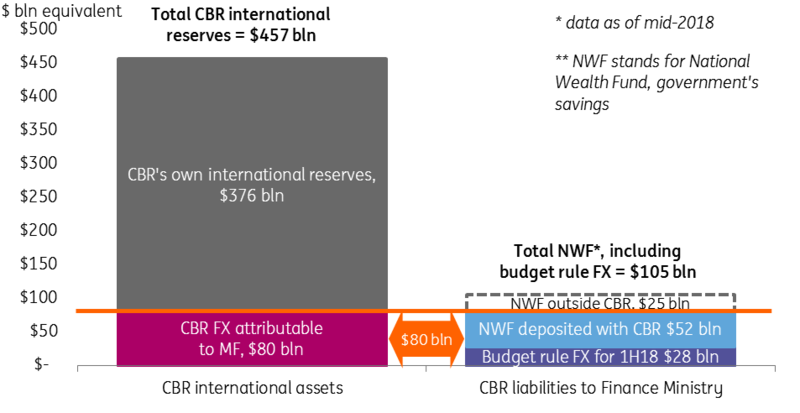 One important caveat, is that by the end of 2019, the official size of NWF may hit 7% of GDP (around US$120 billion), which would allow the Finance Ministry to diversify its savings away from the CBR accounts into more risky vehicles - ie, will be able to keep a flat USD position of around US$65 billion with the CBR. Given the above-mentioned calculations, the lowest possible amount of USD assets the CBR has to keep in order to avoid risking its FX position is US$65 billion, which suggests that the CBR could de-dollarize its FX assets by another US$30-35 billion from the levels seen in mid-2018. This may already have happened in 2H18 or is possible going forward. Such a move would follow primarily the foreign policy logic and would not reflect the structure of the FX market, which is 80% USD, or trade, as around 70% of Russia's exports and around 35% of imports are settled in USD. This is also the key reason why the Finance Ministry is unlikely to lower the share of its USD purchases anytime soon.